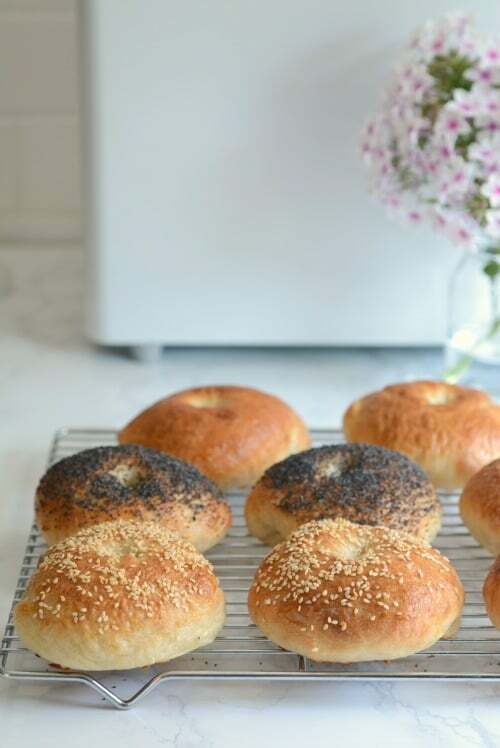 Save time by making homemade bagels using your bread machine. 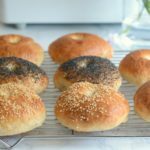 These Bread Machine Bagels are soft, chewy, and so much better than store bought! I’ve been a little obsessed with homemade bagels. 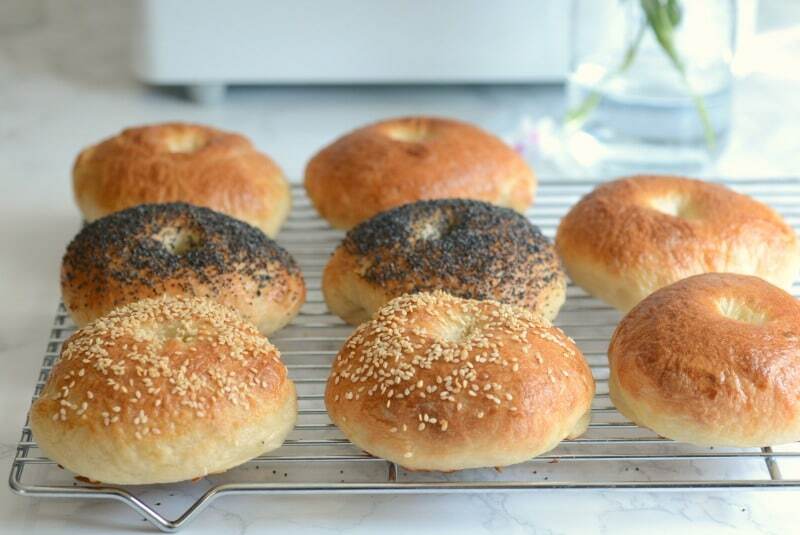 Since a friend of mine shared her bagel recipe with me earlier this year, I’ve been baking and tinkering and I’m happy to say that I’ve made my best batch yet. I know bread machines are very 1996, when people wore pagers and watched Party of Five. But if you’ve got one of these appliances on a basement shelf somewhere, dust it off. Because it makes the bagel making process so much easier. The bread machine does a lot of the heavy lifting in this recipe: Dump the ingredients in, push a button, and the mixing, kneading, and rising are all magically taken care of. Use a kitchen scale: I bought this scale and use it to weigh all of the dough balls so they’re roughly the same size. This not only makes the batch look more uniform, it also means they’ll bake more evenly. Roll the balls the right way: It’s actually best to roll the dough on an un-floured surface, because the stickiness of the surface helps the balls form a better shape. I used this super helpful tutorial to help me get the shaping just right. As you can see, they’re still not all perfectly round, but perfection is overrated, right? Once you form the dough balls, all you have to do is use your finger to create a hole in the center and gently stretch it out to the size you like. Then boil them, brush with egg wash, sprinkle with toppings, and bake. 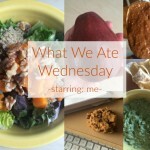 Favorite toppings such as poppy seeds, sesame seeds, shredded cheese, coarse salt, etc. Place water, flour, sugar, and salt in the bread machine (in that order). Make a small well in the top of the flour and pour yeast inside, then cover well with the flour. Set bread machine on the "dough" setting, which will mix the dough and allow it to rise. When setting is done, punch down the dough in the pan and let it rest for 10 minutes. 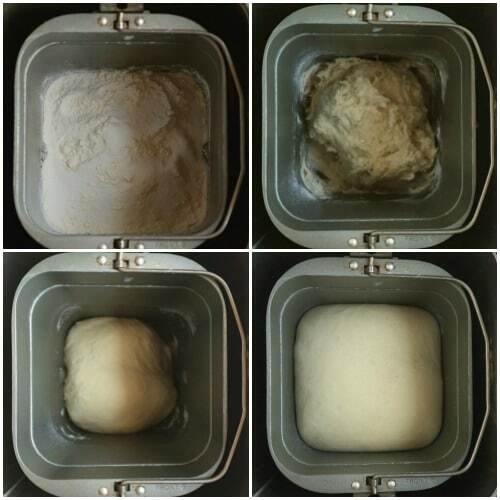 Remove dough from bread machine and divide it into eight equal pieces, then shape each into a dough ball by rolling it gently in a circular motion against the (un-floured) counter. 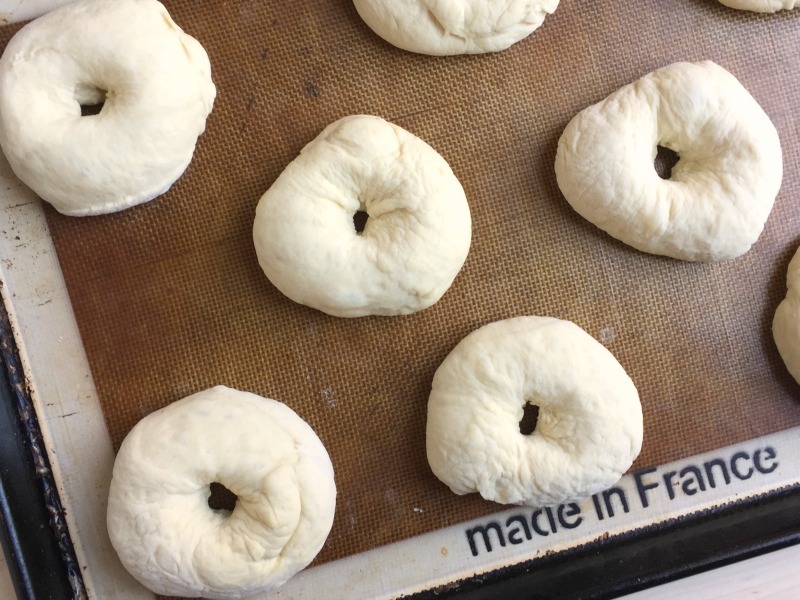 Coat your finger in flour and press into the center of each dough ball to form a ring, gently stretching the ring into a bagel shape. 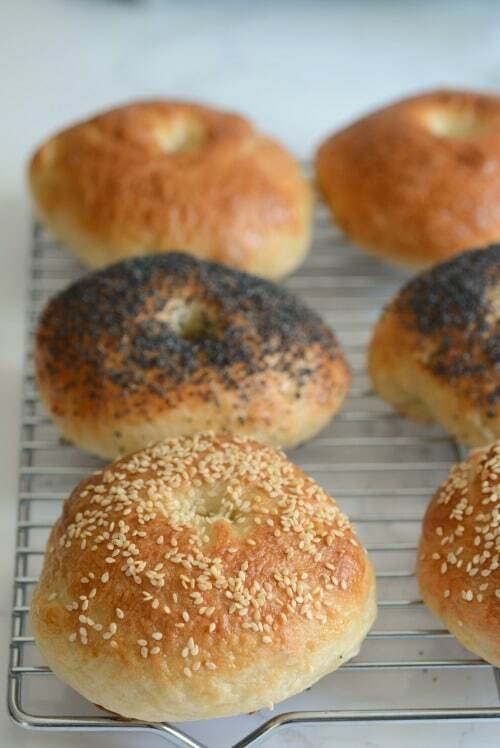 Cover bagel shapes with a damp kitchen towel and allow to rest for 10 minutes. Preheat the oven to 425 degrees and bring a large pot of water to a boil. 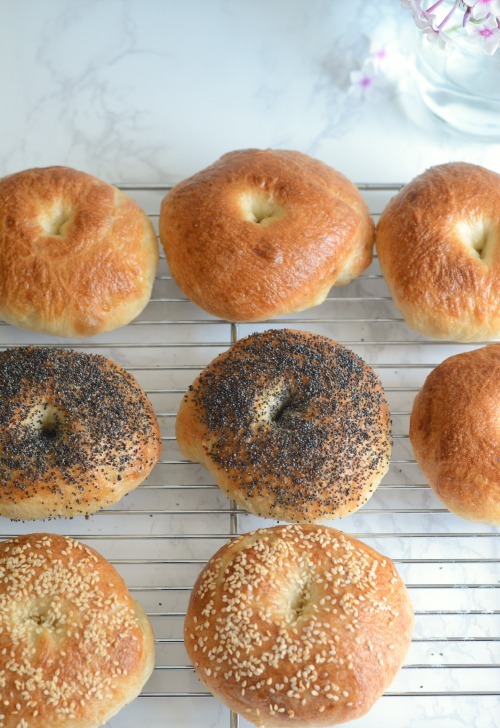 Place bagels 2-3 at a time into the boiling water with a slotted spoon (or by gently lowering them into the water). 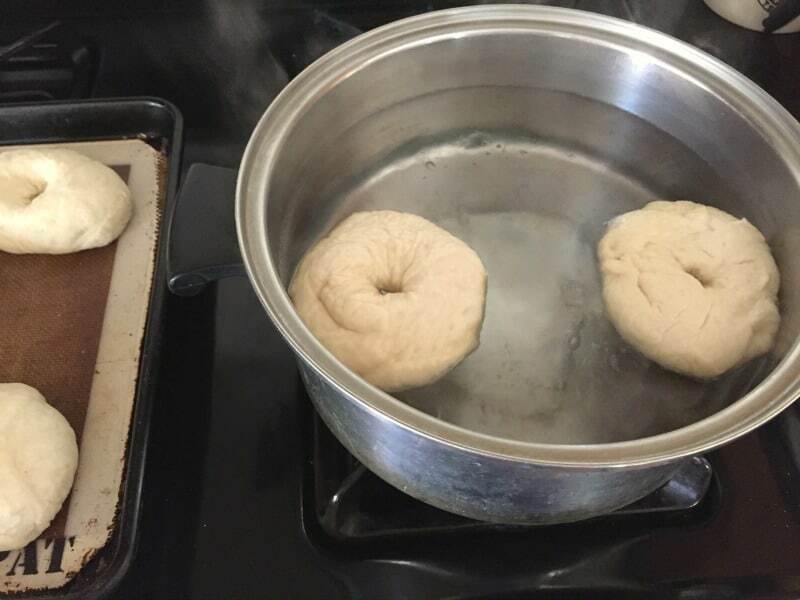 Let bagels sit in boiling water for 1-2 minutes, then flip and allow to sit in water for an additional 1-2 minutes (the longer they are in the water, the chewier the texture will be). Remove from water and place on baking sheet lined with a silicone mat. Brush bagels with egg wash (1 beaten egg plus 1 tablespoon water). Add toppings if desired. Bake for 20 minutes or until golden. Remove from baking sheet to a cooling rack. 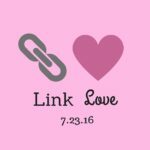 This page contains an Amazon Affiliate link. 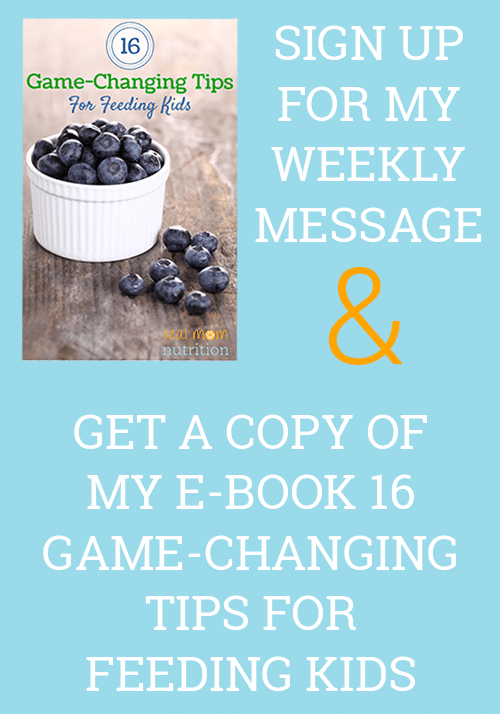 If you purchase a product through this link, your cost will be the same but I will receive a small commission to help with operating costs of this blog. Thanks for your support! I made these with my 3 y/o grandson today. So easy and so good. I used Trader Joe’s Everything But The Bagel seasoning on half and it was spot on. Jeez Annie! That was a joke. I’ve had my bread machine since 1996 when they first came out and were popular. My trusty Sunbeam is still truckin’ and I love making homemade bread, pizza dough, and bagels in it. Did you give the recipe a one-star review because you made it and didn’t like it? If so, I’d love to know why in case your feedback helps others. If you did it just because that comment rubbed you the wrong way, that’s a bummer. This recipe makes me wish I had a bread machine (for this recipe and I’m quite partial my care free days in the late 90s – ha!) I’m looking forward to trying it in my Kitchen Aid mixer (with dough attachment) and I’m sure it’s going to be fantastic like other Real Mom Nutrition recipe I’ve made in the past. I absolutely love this recipe. Best bagel I’ve ever had. I added sauteed onions and garlic halfway through the bread mixing cycle and coated with cheese with my eggwash. Really simple and so satisfying. Thanks for this! I’m so happy to have found this recipe. I made these today with my breadmaker and topped a few of them with cheddar before baking. 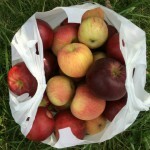 They have a crisp crust and are nice and chewy inside. Thank you so much for sharing! I will definitely be making these many more times! 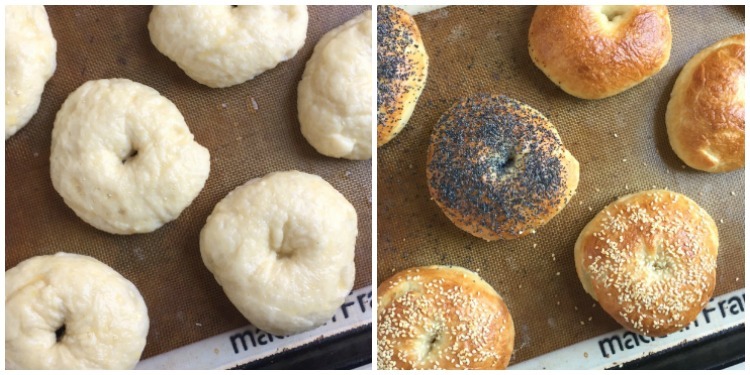 I have never made bagels before because I thought they would be difficult. 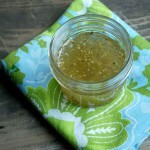 Love love loved this recipe! So much easier than I expected and they turned out perfect!! Have you tried different flavors? So glad you liked them Rachel! 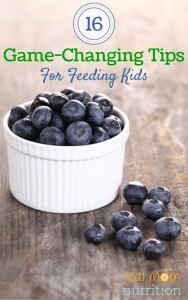 I have not tried flavors behind topping them with cheese, poppy seeds, cinnamon/sugar, etc. If you try that, let me know how it goes! Love love love this recipe and you’re right it was so easy! Today was a first time try and they turned out excellent. I added a teaspoon of poppy seeds in the dough as well and even the family member who normally won’t eat bagels are begging for more! Definitely a keeper.